The red Colori frame from Framerica echoes the heat from the chili pepper artwork. The Colori line features 15 profiles in seven colors. Matching fillets add to the versatility of the collection. When designing picture frame projects, color is a key element. Frames are a great way to bring a color to the front and center of room decor, define an accent color, or unify a color scheme. 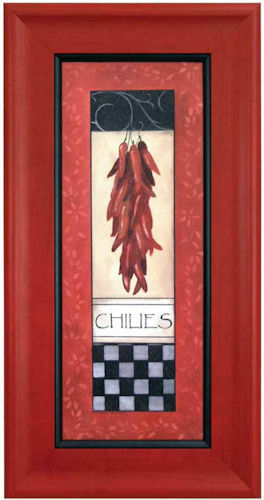 The red Colori frame from Framerica echoes the heat from the chili pepper artwork. The Colori line features 15 profiles in seven colors. Matching fillets add to the versatility of the collection.Colorful mouldings can even add pizzazz to neutral color schemes. We can help you choose the perfect color for your home and art. Colorful frames, like those we offer, also come in textures and patterns. Stack a combination of mouldings to create an interesting new look. Use dif- ferent widths to add dimension. Matching fillets also add to the diversity of colorful frame designs. Colorful mouldings can be contemporary or traditional, depending upon the type you chose. Primary, pastel, or metallic in loud or soft tones—our shop has it all. There are many ways these mouldings can be chosen. It may be a single, solid hue with a matte or glossy finish. The color may be a stain over wood so the wood grain shows through. Instead of overall color, the frame may include a panel of color combined with a woodtone, multi-color, or metallic finish on other parts. Antiquing and texture are other styles of colorful moulding that spice up artwork and add an interesting feel to any room. We will work with you and show how the newest color trends and design can be part of your framing experience. The latest fashions and styles apply to frames too and we are always finding new ways to use these colors. Design possibilities are endless. Even when gold, silver, or stained wood mouldings are used, the specific yellow of the gold, gray of the silver, or brown of the wood is crucial to the frame design. A perfect match should not always be your goal. Contrast and coordination are other design elements that can be brought into decor when using col- orful mouldings. The most important thing to remember is not to over- power the art. Our frame designs highlight and complete the explosion of color by using beautiful and colorful mats and frames. We will help you keep up with the latest trends or stay traditional— either way you can liven up a room—by using colorful frame designs in your home decor. Stop by and see us soon.